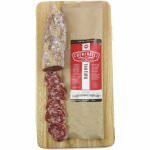 Salami Sopressata, also called Sopressa Veneta, got its name from the practice of pressing the salami between planks of wood resulting in a straight, flattened shape. The northern Italian version from Vicenza, in the Veneto region, did away with the pressed shape and has become an international favorite. It is also prepared in a small round format called Muletta, named after the unique type of casing used in its preparation. 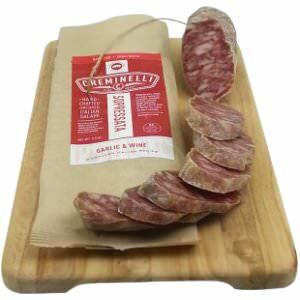 Sopressata is known for having a more robust taste thanks to the generous amount of garlic added. 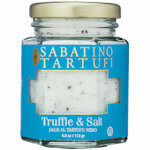 It is produced with the highest quality pork cuts, coarsely ground with salt added. Just before stuffing, additional spices are added including the garlic crushed by hand and dissolved overnight in a generous portion of wine. 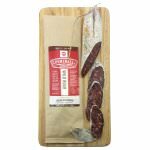 Ingredients: Pork, sea salt, natural flavors, organic spices, sugars, wine, organic garlic, lactic acid starter cultures (in beef casing).